I wasn't going to post this photo, as it's not as clear as it should be. 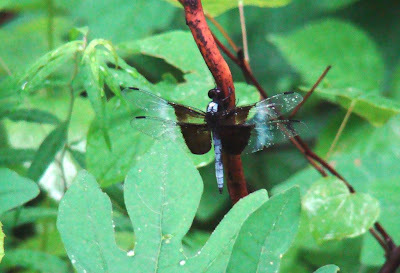 But because I also didn't know what kind of dragonfly this was, I used the photo to help identify it. And as I learned more about this Calico Pennant dragonfly, also known as an Elisa Skimmer, I decided to go ahead and run the photo anyway. This one is a male. The females are yellow where this fellow is red. The Calico Pennant is quite widespread in some areas. Pennsylvania isn't one of those. In my region, the calico is only reported in my county and two neighboring ones. Then there's a gap of many counties, reports of it in the western part of the state and again in several counties in the eastern part of the state with more gaps in between. Oddly, at least to me, this pattern is also repeated thoughout most of the calico pennant's range, with the exception of Ohio and New Jersey, where it's reported in almost every county. So I'm wondering, do these reports have more to do with the people reporting sightings or with the dragonfly's actual range? Doesn't it seem odd that it's found everywhere in Ohio and New Jersey but only reported sporadically elsewhere? 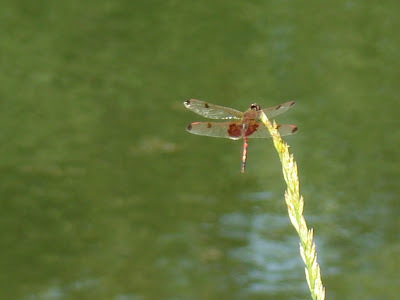 The calico pennant I found was over on the new pond at Roundtop, and its habitat is described as ponds and marshes, which is the typical habitat of virtually every dragonfly in the world. Nothing seems unusual or atypical about that. The new pond isn't atypically large or small and it doesn't have much in the way of marshy vegetation, like cattails, along its edges. So why would this lovely dragonfly appear to have so many gaps in its range? I suspect these alleged gaps don't really exist. I think this beauty is simply unreported or under-reported. And since now is the time the calico pennant is busy flying around, maybe this would also be a good time for people to get out there and look for it. Let's fill in a few of these gaps! I fully admit that this is likely the worst frog photograph you have ever seen. I know it's the it's not the frog photo I wanted to take or post. After months of waiting and various attempts, this is the best frog photo I've been able to come up with. Very disappointing. Last year, at some point during the summer, I counted 73 frogs leaping into the water as I walked around the half-mile circumference of the new pond. This year, there are easily double, if not triple that number. When I walk around the pond it's like a froggy ballet, one after another, leaping from some invisible spot along the pond's edge to the invisible safety of the water. I've tried sneaking up on them. I've tried walking slower than slowest super slo-mo known to humankind in hopes I wouldn't scare them. I've tried sitting immobile for what feels like hours in the broiling sun hoping they will think I'm a stone or a stump or something and return to their pond-side perches. No luck. These stupid frogs are too smart for me. I give up. So here's my frog photo, such as it is. 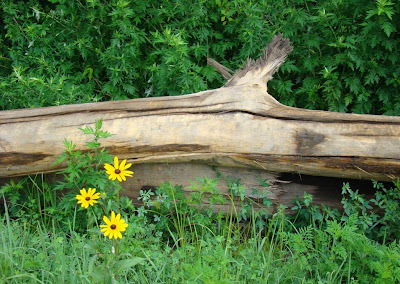 You can just barely see this guy's eyes and head peeking around the edge of the log. It's a green frog, which is what most of the dozens of frogs currently inhabiting the new pond are. I have heard several bullfrogs, too. 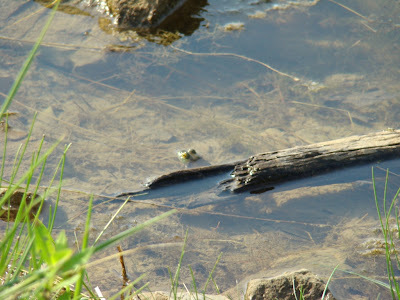 Since I haven't been able to get closer, I don't know if any other species are here, perhaps pickeral or leopard frogs. Green frogs, also known as bronze frogs, are the most common ones in this area. There's been many stories locally about how native frogs and salamanders were decimated by acid rain, which caused breeding to fail. Much work was done to improve that situation, though many streams and ponds have been slow to recover. Perhaps because the new pond is, well, new, the water here is benefiting from that work in a way that is not seen as dramatically in pre-existing ponds. Perhaps it's because the water in the new pond is periodically replenished with fresh water from the nearby Beaver Creek that acidity here does not appear to be as problematic as elsewehere. Whatever the reason, the local frogs are thriving and numerous, though they sure aren't willing to pose for pictures. Don’t these two make a handsome pair? 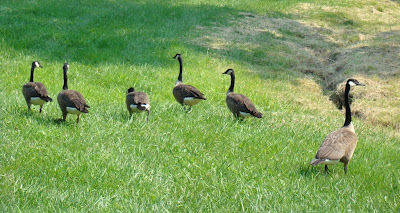 They were parading around Roundtop the other day, oblivious to passing traffic (not that there’s much). I’m always a little surprised at just how large turkeys are, much larger than Canada geese. And yet, I see them not all that often. Wouldn’t you think that a creature this size would stand out more? And since where you find one turkey, you always find more, sometimes many more, I’d think they’d be more obvious, somehow. And even if I didn’t see them all that often, I would expect to see more signs of them—hear the gobbling frequently, see signs of scratching more often, but I don’t. And then suddenly, they simply waltz out into the open and remind me they are still around. Funny birds. I'm at that point in the summer season where I'm waiting for the next thing to happen. Summer is here. It's in full swing. I'm ready for it to be done and something else to take its place. I thnk one of the reasons I don't care much for summer is that it feels a bit static to me. It arrives, it stays and little changes until it's time for fall. Spring and fall are seasons of near-constant change. Winter also feels changeable to me--the deepening or lessening of the temperature with the ever-present threat of storms. To me, summer doesn't change all that much. I get bored. It's probably just me. The flower in this photo is, I think, a yellow loosestrife. It might be an intermediate yellow loosestrife, one of the lysimachia family. It’s the pointy leaf shape that makes me think that’s what it is. This weekend did not proceed as I hoped. 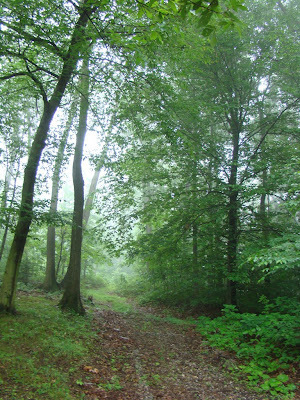 I managed to carve out some time for a nice walk in the woods but thunderstorms kept me from venturing too far. Saturday was consumed with errands early on, and by the time those were taken care of, rain and thunder ruled the afternoon. Dog and I actually got to set out on a walk on Sunday morning. I think we’d walked all of about 150 yards when a big boom of thunder rolled through the forest from lightning that was only 2-3 miles away. We turned around and went back to the cabin. The storm played around the edges of the forest for several hours, and when it finally moved off for good, the temperature was too high for an enjoyable walk, so we weren’t able to do the major exploring I like to do on the weekends. I watched the hummingbird wars from my front deck—those little warriors cleaned out the feeder in two days. Between guarding the feeder and chasing off intruders, it’s no wonder those tiny birds use so much energy. 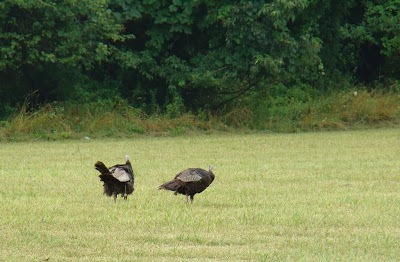 A pair of Wild Turkey rambled around after one of the storms passed—no young with them, though. It was a quiet weekend. Summer doldrums are here. For at least a day or two, I am giving up looking for things in the forest that are not-green. I’ve decided for the moment to go with the greenery around me, so today’s photo reflects that. 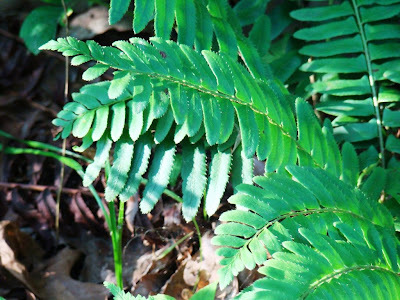 This fern is a Christmas fern, one of the most common ferns around the woods of Roundtop and throughout the east coast. Christmas ferns are so named because they stay green all winter and were once commonly used in Christmas decorations. References I have found suggest that the fern was likely named in the Victorian era, when ferns were especially popular. For a while, apparently, the ferns were so popular as Christmas decorations that they became difficult to find in the wild. Fortunately, that craze has passed, and this fern is common again. It is reported to be often seen with wood ferns of the genus dryopteris, which I can confirm to be true, at least here on Roundtop. So far the summer heat in July here on Roundtop feels about average, but 2008 is turning out to be wetter than has been typical over the last several years. The last several summers were especially dry ones, however, so this year may simply be a normal one again. After a few dry summers, I lose my sense of what "normal" is supposed to be. This morning the forest is still a bit foggy after the storms of the past few days but greener than it was before the latest round of storms. I snapped this morning’s photo along the trail that runs over to the "new" pond, which is now 3-4 years old. In this photo you can’t see the pond itself, but you can see towards the back of the photo that the trees are thinner on the left side of the photo compared to the right side. The left side is where the pond is. With all the rain, the forest should stay this lovely deep shade of emerald green for at least a week or two even if hot weather returns, which thankfully as far as I’m concerned, isn’t in the forecast. It is now noticeably darker in the mornings than it was just a week or so ago. I don’t need my headlamp yet in the mornings when I walk Dog and Baby Dog, but that event isn’t far off. Already, I can tell the light difference by the birds I see. Gone are the robins and bluebirds when I take the morning walk. They aren’t up yet. Instead, I see only crows and hear little more than the early-rising pewees. I am already planning this evening's walk. The storms are past now, and the forest should be drying out enough so that I can walk in it without getting soaked. I know I will see something different and unusual. I always do. If it’s one thing I’ve learned from my years of living here on the mountain, it’s that the forest changes from week to week, from storm to storm. It is never the same. Different plants bloom, different insects are out, the teenaged birds begin to appear, confident they own the world. The forest always changes, is always different. There's always something new to see, and I look forward to finding it. This morning’s photo was a lucky one for me as I have notoriously poor luck taking photos of dragonflies. Last night it stormed again, though this time I didn’t get hit with the worst of the wind and lightning. So this morning it is foggy and still raining a bit, and I was planning to get a foggy morning forest photo. While I was setting up that shot, I suddenly saw this Widow Skimmer on a leaf almost in front of me. Miracle of miracles, it didn’t fly before I got a quick shot. Widow skimmers are a common dragonfly in most of the U.S. They are probably the most common ospecies here on Roundtop. This dragonfly got the name "widow" as the male doesn’t stay with the female after she lays her eggs, as most of them do. This dragonfly is, I think, a male, though perhaps not quite an adult male. Males have white areas on the outside of the black area on the wing. This one has a bit of that, though his white area isn’t nearly as defined or as large as others I’ve seen. There’s a good site called NJOdes (for New Jersey Odonates) that specializes in dragonflies and has tons of good photos and information to help ID them, at least for the New Jersey species. Still, many dragonflies are pretty widespread, so even folks not from the east coast may well find what they’re trying to ID here. So today is likely going to be a long day for me. The storm came through last night around 2 a.m. (I think), bringing thunder, lightning, rain, wind and the sudden appearance of 60 lb. Dog on my bed. This time, the closest lightning strike was about a mile away, plenty close enough. The storm continued to around 4 a.m., when things finally quieted enough for me to fall back asleep. As I said, this time I didn’t get the worst of the storm, but a short night’s sleep will likely keep me out of sorts, at least until I get an extra cup of coffee. 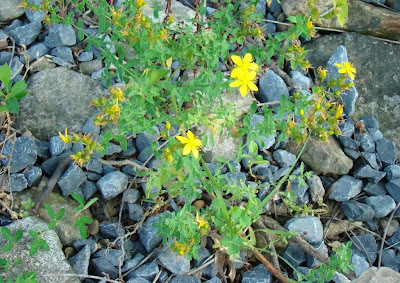 Today’s flower is St. John’s Wort, so named as its blooming typically coincides with the festival of St. John on June 24. This plant is (yet) another one brought over to the new world from Europe. I am starting to wonder what this area looked like before all these plants arrived from Europe. Some days it feels as though everything I thought was a native plant turns out to be an immigrant. More of the forest’s annual plants around me are starting to turn yellow-ish and are beginning to die back. In addition to mayapple, last evening I saw a few raspberry bushes that are starting to yellow at the tips. I’m trying not to include any individual plants that may, for whatever reason, be stressed. If I don’t see several plants of the same species in different locations that are showing the same tendencies, I’m not including them. I’m starting to think that this beginning of the die-off is earlier than usual, though I have absolutely no idea why that would be so. Even in dry years, August is typically the time I notice the annual plants beginning to yellow. 2008 has not been a dry year. It’s been pretty average for rainfall, even slightly (though not terribly) above average. The temperature has not, overall, been extreme either. However, in mid-June this area had a 3-day spell of near 100 degree temperatures, which was very high for that time of the year. Could that have somehow impacted when the annual plants start to die back?? Is the cause something else entirely? Perhaps the leaf canopy is thicker than usual and not allowing these plants to get the amount of sunlight they want. This is yet another mystery for which I have no answers. The forest is like that. Always something unusual going on., if I am observant enough to see it. This summer’s batch of Canada Geese are nearly full grown and are now almost the size of the adults. In fact, I know both parents are in this photo, but the only one that’s obviously a parent is the goose on the right watching protectively. The young birds can’t fly yet, but that event won’t be far off now. The heat wave here on the mountain is not quite broken yet, but it is on its way out. Today it’s only supposed to reach 90 degrees, an improvement. Last evening, not long before dark, I saw the sky darkening and knew a storm was on the way. Thunder rumbled in the distance. I closed all the windows. The wind picked up and was soon followed by a near-torrential rain. All of a sudden, a huge lightning flash scared the heck out of me. The flash was instantly followed by thunder. The power went out, though came back on almost immediately. The cats ran under the bed. Dog tried to climb under the sofa. Baby Dog fled upstairs. For a few seconds I afraid lightning had struck the cabin. The storm---that single blast of lightning was the only one—didn’t last long. As soon as I felt reasonably safe and the rain let up, I went outside to check the house. Fortunately, everything looked fine. I also checked out the nearby trees and didn’t see anything there either. All I know for sure is that the lightning was extremely close—probably as closes as I’ve ever had it. I haven’t checked too far behind the cabin yet—darkness soon followed the storm. Perhaps this evening I’ll be able to look at more of the trees behind the cabin. At this point I’m even wondering if the lightning actually struck anything. I was sitting in the living room by the large picture window when the lightning struck. To me, it looked like a big round explosion of light that I’m guessing was some feet into the woods. I never saw a bolt, just that big round light that was blinding. It was almost as though the electrical charge just exploded in the air. As the storm let up, I checked the utility poles near the cabin, and they were all okay, too. So for now this story doesn’t yet have an ending. I just know that I don’t want to have lightning get any closer than that—ever! Moonrise on a clear summer evening is always a magical moment. For me, there's just something special about watching the moon clearing the trees and filling the sky. Somehow it seems rare to me, though it's not. Perhaps it's only that I rarely get to see the moon rise that's special. Sometimes it's cloudy, sometimes moonrise is after my bedtime, but sometimes, the moon rises on a clear summer evening just as the sun is setting, and the result always makes me pause. Yesterday was day three of this little July heatwave, but I got a brief break from it in the afternoon. A tiny thunderstorm cell--the only one in the area--popped up over Roundtop. The tiny cell brought a few booms of thunder and a brief spattering of rain, and best of all dropped the temperature 15 degrees. So my evening was pleasant instead of soggy. Right now around the cabin I'm having a banner year for butterflies, but I have been completely skunked in trying to photograph them. Swallowtails are really in evidence--tiger swallowtails, zebras, pipevine, black--they've all bee around but are impossibly camera shy. Or, I have seen them when I didn't have the camera in hand. And it's not just swallowtails--Great Spangled Fritellaries, Painted Ladies--they are all having their moment right now. Perhaps today will be the day when one will pose for me.! A summer heat wave is insinuating itself onto the mountain for a few days. Up here where I live, the day’s high temperature is nearly always a few degrees lower than down in the open suburbs. The trees offer both shade and protection from the worst of the heat. Unfortunately, the mountain offers me no respite from the humidity. Indeed, sometimes I think the trees make the humidity feel even worse, especially on those days with little breeze. The current heat wave will be a mild one and only barely qualifies. In this area, to be termed a heat wave, the weather must be at least three days in a row of 90 degrees or more. This one might run to four days, but two of those days the high temperature is only to be right at 90 and the other two days are only predicted to be 92 or 93. So it shouldn’t be too awful, plus it is July and weather like this is to be expected here. What constitutes an official heat wave varies from area to area, though meteorologists have an official definition that says the daily maximum temperature should be at least 5 degrees above average maximum temperature for five consecutive days. Apparently, the more commonly used definition in the U.S. is the 3-days and 90+ degree one, which was defined in 1900. Other countries have their own definition. In the Netherlands, for example, a heat wave is 5 consecutive days above 77 degrees F., providing at least 3 of those days are also above 86 degrees F.
In any event, it’s summer and it’s hot, which is the main reason why I am now officially reporting that the start of winter is just 158 days away. Even so, I will be happier when fall arrives but will begin to improve once fall migration starts, which is usually before that. Shorebird migration might even be starting now, but as I don’t live near a shore I can’t quite bring myself to count that. Still, if I’m lucky, a few shorebirds may pause briefly on one or the other of the snowmaking ponds. I can only hope. Now is the time of the year in my woods when the vegetation is at its fullest and most lush. 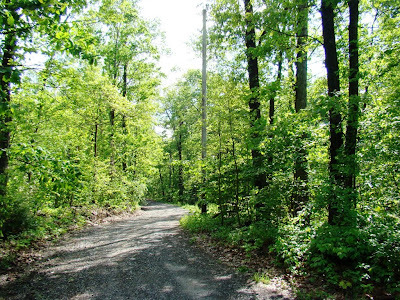 The color of the forest has darkened from the bright neon green of spring to a rich emerald tone, though hasn’t yet begun to fade towards the dull green of late August. The woods feel more indolent than they did just a week or so ago, slower now that the frenzy of spring has passed. The evenings are still, filled with the song of wood thrush, and near dark, with the solitary call of a pewee. The pewee’s call almost echoes through the forest, the notes filling the empty spaces between the leaves and lingering long after the other birds have settled for the night. Mid-summer has a quietness, a stillness, of its own. It’s not like the silence of winter, where a small noise travels far through the bare trees, though few noises arise to break that silence. This is more like the quiet of a room with the door closed behind me. Only someone inside the room can hear what happens in the room. Noises from the other side of the door are muffled, distant. 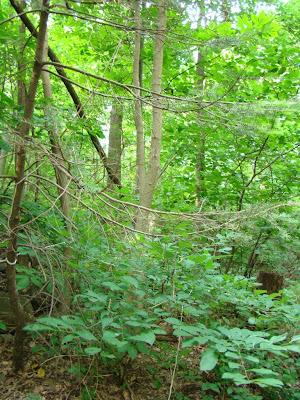 In the summer forest, the leaves are like doors, screening away the noises from just a few trees away. And so the pewee and I are in the same room, in a way, in the same corner of the summer forest, where even such a small sound can fill the room. Today’s photo shows a wall of the "green box" that surrounds me right now. This year the vegetation seems especially lush. This isn’t surprising. After several years drought of greater or lesser severity, 2008 has been marked by rainfall that’s a bit above the average. Just as important, the rain has been spaced appropriately, with rarely a week passing without at least a little rain. his weekend I tried to visit my "experiment site" and found I couldn’t get through the vegetation from the direction I usually approach. In truth, I didn’t try particularly hard. I was wearing shorts, and long pants and a lopper for the thistly vines might well have done the trick. I will try again once the forest dries a bit. am already noticing a few of the forest’s annual plants turning yellow and starting to die back. I was aware that plants like the mayapple die off early, but I tended to think that a July die-back was due to lack of rainfall in the previous four to five years. That I’m still seeing these plants dieing now in a year a good rainfall has finally gotten through to me that these are very short-lived plants. Perhaps I should make this the first "sign" of fall. Another change: This morning it was darker when I walked Dog than it has been for a while. For some reason, I had it in my head that the shortening of the day's light wasn't noticeable on our walks until August. Today's photo is a touch-me-not, also known as jewelweed. Last year I remember posting a photo of a spotted touch-me-not flower. This one does not have any spots and may be a different variety. Whenever I see the spotted touch-me-not, the spots are pretty noticeable, which as you can see in today's photo, aren't in this plant or the ones that were around it. Touch-me-nots are so named because when you touch them, them fall apart, often into a kind of gelatinous mass, which appeals to children once they get past the gooiness of it all. 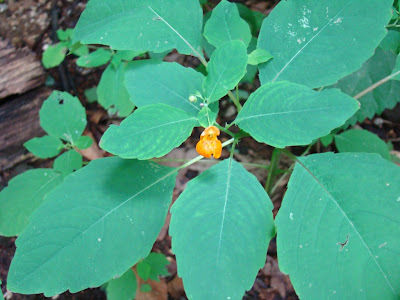 Most of the information I've found about jewelweed or touch-me-not is about what it is not. It's not a good remedy for poison ivy, but in times past people thought it was. 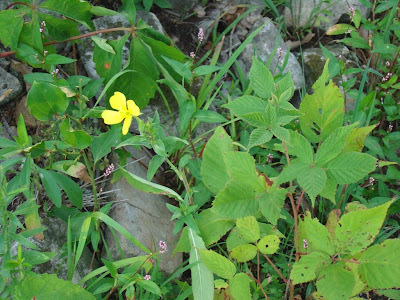 There's even an old saying, "Wherever poison ivy is found, jewelweed grows close by." Even the saying is wrong, apparently. Touch-me-not prefers to grow in disturbed areas, preferably ones tending to shade and thrives in spots with a limestone-rich soil. Poison ivy isn't that picky. Touch-me-not is a member of the impatiens family and whether because of that or whether because of its now-debunked anti-itch properties, this was a plant that was taken back to Europe after settlers arrived in the New World. That's quite a switch, as I've too often found wildflowers I've assumed to be natives only to discovered they were introduced from Europe. Apparently touch-me-not can still be found there, though it hasn't hybridized with any of their native plants. Question: is it just me, or do American goldfinches appear to be dispersing earlier than usual? I think of August as the time when goldfinches are "vacationing" and traveling around, but they seem to be starting their travels early this year. And in late news, Derby Hill, a prime spring hawkwatching spot along Lake Ontario in New York, reported 40 northbound Broad-winged hawks on Tuesday. I had to read the report a couple of times before the information was successfully implanted in my brain. I kept trying to turn the birds into south-bound or fall migrants. The birds were either migrating or dispersing north ahead of a front and were clearly kettling and streaming. I half expected a tornado to pop out of this cloud last night, and fortunately that didn't happen. I had a meeting in the evening and was driving back to the cabin, knowing I was just a step or two ahead of the storm. Then I got out of the car to take a few photos. As a result, when I did get back to the cabin a few minutes later, I only just pulled into the lane when the sky opened up, and a torrent of rain kept me from getting out of the car. It was like someone dumped a huge bucket right on top of Roundtop. I had over one inch of rain in 15 minutes, and I was lucky. Several miles away, they ended up with around 3 inches, but several miles to the north not a drop fell. I've been working on the fall issue of Hawk Migration Studies, the journal published by the Hawk Migration Association of North America, and this week while editing the eastern flyway report, the flyway editor wrote that he lamented what he called the "new weather." I'd not heard this phrase before, but the more I think about it, the better I think it's a good one. Back in the day, more than 20 years ago when I first started hawkwatching, we didn't know nearly as much as we do today about weather and migration. But, even then experienced hawkwatchers had a tendency to call in "sick" at work and show up on a hawkwatch in the fall the day after a cold front blew through, bringing with it northwest winds. For some years now, the problem has been that fall now rarely brings those sweeping cold fronts, and as a result patterns of migration have changed. The flyway editor was noting that traditional hawkwatches that used to get many thousands of hawks (and other avian migrants) now rarely get those excellent flights. Instead, because the weather and wind patterns have now shifted, some ridge or hill that never saw much of a flight before is suddenly the stellar site from which to watch migration. Migration is no longer funneled by wind patterns past the traditional migration sites. Instead, migration now often follows a broader front or ends up on the coast or sometimes runs more inland than before, and these new areas are suddenly the hot spots. I was thinking about this "new weather" last night when this storm clobbered my little corner of the world. Summer thunderstorms are not a new phenomenon here, but what is different is that the storms pass almost every night. Further, the storms are more localized. Instead of a storm that hits the region as a whole, these intense cells suddenly pop up, seemingly out of nowhere, and douse a small area with lots of severe weather. Only a few miles away, the storm isn't even present. Weird, eh? I guess it's just the new weather. Today’s photo is the leaves of a sassafras tree, wet from the storm that I got last evening. The leaves are often described as being a mitten shape, though I've never had a pair of mittens with three fingers. Apparently some of the leaves do have two lobes instead of three, but I don't think I've seen that on any of the local trees. When I was a kid my dad would pluck a leaf and let me chew on the end of it, the way you might chew on a blade of grass. The flavor is wonderful, kind of minty in a way, though without quite as “bright” a tang to it. The roots were used to make sassafras tea and were at one time the flavoring in root beer. Now I read that sassafras is considered toxic and it is banned from food substances in Canada and the U.S. It was found to cause liver damage, though I suspect you'll need to do more than occasionally chew on the end of one. If there’s anything left with sassafras flavor in it, it cannot be made with real sassafras. All I can say is that I’m still here, though I’ve never gobbled sassafras in any amount. Chewing on a leaf once a year is about my limit. The oil is still used in some fragrances, though. And did I mention rain again? I’m now up to day 3 with my laundry still on the line. Last evening, if I’d gotten home 5 minutes earlier, I could have had it off the line and in the drawer. Instead, it was doused with nearly an inch of rain. This is starting to be kind of funny. I wonder if tomorrow will be the day…. Rain and humidity have dominated the past few days in the natural world around my cabin. The rain was welcome, and everything looks newly green again. The humidity is less welcome. Nothing dries out—not the clothes on my line, not me. Even inside the cabin everything feels damp. Today—more rain. I’m just hoping the clothes don’t rot before they dry. High humidity is one of the hallmarks of summer in this area. We even have a name for it—the 3 H’s (hazy, hot and humid). At the moment I am experiencing two out of those three. Fortunately, it’s not all that hot. But even with a temperature of only 75 degrees or so, the extreme humidity makes me feel uncomfortably warm, because the dew point is nearly the same as the temperature. Humans start to say the weather feels oppressive when the dew point gets to the range of 59-68. Currently, I have 70 for a dew point. It’s a bit like breathing water right now, only without the gills. I didn’t foray much into the woods this weekend. Even the dogs didn’t seem to mind my lack of activity for once. Last evening but well before dark, a time we usually spend walking, we sat out on the front deck and listened to two great horned owls call. The birds were close to the cabin, and nearly every call came from a slightly different spot, though I never saw them. The dogs were content to loll on the deck with me and didn’t seem to miss our evening walk. Baby Dog barked at the owls, though. Dog and I didn’t move. Yesterday I heard the guns of Gettysburg, cannons rumbling deep and low across the hills and valleys. The sound started slowly, and for the first moments I thought it was distant thunder. But then the sounds quickened, and I knew. One hundred forty-five years ago, those cannons fired in earnest, at brothers and sons and friends across opposite lines. The sound was louder then, loud enough at some point to wake a babe that slept only a few feet away from where I sat now. Like the people who lived then, the sound was first thought to be thunder, and like me now, they soon realized that it wasn’t. Still, for a few moments last evening, I understood, a bit, what it was like to have lived here then, when those guns of Gettysburg first fired at brothers and sons and friends across a grassy field. Last evening I sat some 20 miles away from the battlefield, and the sound of cannons fired across the fields in a reenactment of those three days still reached me and took me back 145 years. Freedom isn’t free, nor does it come cheap. Its cost is very dear, in every sense of that word. Its value is still worth every drop it costs. Butter and eggs is one of my favorite wildflowers. The name alone is enough to intrigue me. It’s so descriptive yet so unscientific. I tire of logical, scientific descriptions in the names of things. Those kinds of names just feel so bland and lacking in joy after a while. I find nature endlessly joyful, and I believe names should at least attempt to capture that. Can you blame someone for not wanting to rush right out when they hear Clay-colored Sparrow? I mean, really, aren’t they all, just about? Or Smooth Hedge Nettle? That doesn’t sound very exciting either, though it has a lovely little flower. But a name as simple as butter and eggs, how could you not want to see that? 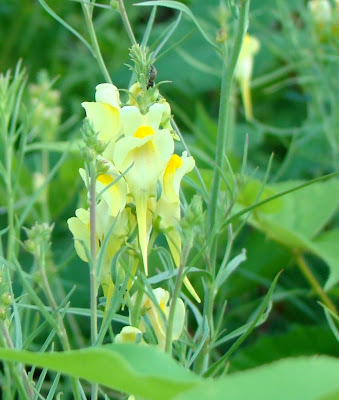 Another common name for butter and eggs is toadflax, which isn’t bad either, though simply isn’t as pretty a name as butter and eggs. 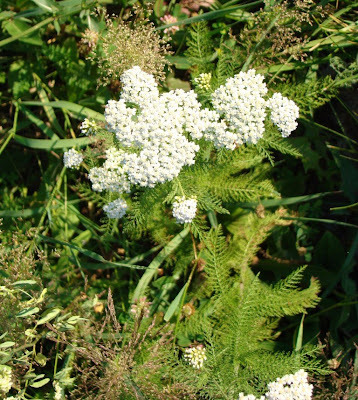 It’s also called brideweed, bridewort, butter haycocks, bunny haycocks, cat’s snout, dead men’s bones, devil’s flax, eggs and bacon, impudent lawyer (now there’s a good one) and lion’s mouth, to name just a few. And I do mean just a few. 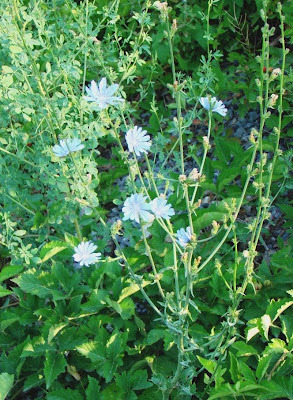 The plant is a favorite with bees, bumblebees, moths, butterflies and other strong insects. Because the flower’s underlip is largely closed, wimpy little insects aren’t going to be able to pollinate it. As so many of our North American plants are, butter and eggs is not native to the U.S. It’s native to Europe and "escaped" from early settlers’ cultivated plots. Today, of course, it is common along roadsides and well-drained areas. I found this one this morning on a bank, growing next to chicory and assorted other plants that are happy to be feral , just like me. Summer mornings can be lovely times. Before the heat of the day withers plants and people alike, before the air fills with humidity, before thunderstorms send me scurrying inside, before all that are the mornings. In the mornings of summer, the air feels warm and comforting, not cloying. In the mornings a breeze caresses and whispers before it dies under the afternoon sun. Deer tiptoe across the lane in front of Dog and me. The birds sing. Ah, if these early mornings would only last all day! 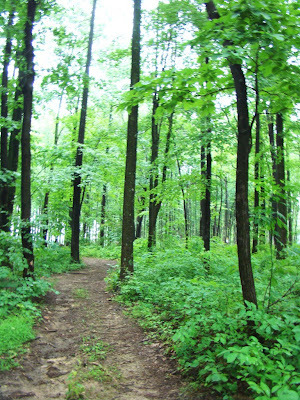 Now that Adventure Camp is over until mid-July, my daily routine of walks around the forest is getting back to normal. I’m already surprised at the difference just a few days away has made. After the spring wildflowers finished their blooms, I had a week or so before the summer wildflowers started. For that week, few blooms were in evidence, and the landscape seemed an unremitting green. This week, I have new blooms and new colors again! St. John’s Wort is starting to bloom. The various clovers are blooming. More daisies are in bloom. The Queen Anne’s lace is out, plus the purple ironweed and blooming raspberry. The day lilies or farmer lilies line the roadsides. In short, everything around me is colorful again. Readers of this blog know that I am not a summer person. Give me snow and winter any day, but barring that fall is fine, and I’m starting to really enjoy that after winter, early spring time before the leaves come out. I have tried, seriously tried, to enjoy summer, but I'm not very good at it, and I'm tempted to stop trying altogether and just spend 2-3 months in a grumpy funk. In summer, I really have to look hard for something about it to enjoy. Here's why I don't like summer: heat and humidity, lightning and the threat of fire, my view obscured by leaves, deerflies, no new birds to see. Well, I could make this list longer but you get the picture, I’m sure. So that week between spring and summer without new wildflowers feels like an eternity to me. 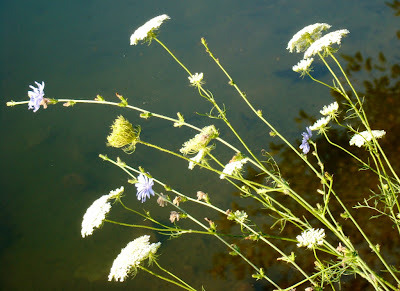 But now, that week is over, the summer wildflowers are here, and I have something to enjoy again about summer. At last!